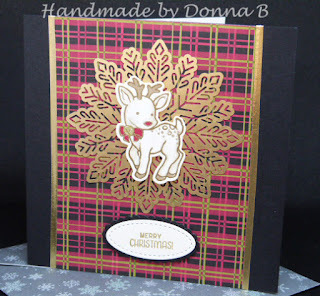 Tonight I have made a cute card using the Seasonal Chums, love this set, as a stand along or tags - this little image leant itself to the wonderful papers, and again those gorgeous foil snowflakes. Not your usual combination for a Christmas card, but I love them Black, Red and Gold very Regal. I embossed the sentiment and used the Stitched Oval Framelits, an absolute must have for your collection. I also used the lovely washi tape, not usually my go to but think I could get use to these as the colours in the pack are great. I coloured the image using the Stamping Blends also adding a gold gel pen for the bell, and a few more dots on his back. As always thanks for looking, and don't forget all these wonderful products can be purchased in my online shop.